Roberto is the man, but is he that different to Moyes? Following David Moyes’ sudden decision to move to Manchester United, it always promised to be a traumatic summer, but no one expected so much change and distress in the first three weeks of the close season. Changes to the badge, an incredibly exciting pre-season tour to the States, and a thorough, but inevitably drawn out search for a new manager, are just the headlines of the summer so far. Thankfully we have come out of those initial three weeks in very good shape to move forward and progress ahead of the new season and with the players due back for pre-season training in a little over 4 weeks’ time it promises to be an eventful first few months in charge for our new manager, Roberto Martinez. At this afternoon’s press conference, Bill Kenwright will unveil Everton’s new manager to the watching media. It is not a closely guarded secret that Everton have been chasing the former Wigan and Swansea manager to take over the Goodison hot seat, with Dave Whelan, in his own bumbling way, keeping Sky Sports and the world informed with minute by minute updates. Everton however have maintained a dignified and professional silence, interviewing a wide range of perspective candidates, from both inside and outside of the club, to ensure that the next incumbent of the Everton managerial position was the best person for the job. Although many Evertonians have championed other candidates, Roberto Martinez will begin his reign with the full support of the Evertonians. Martinez will be faced with a number of challenges and difficult decisions in the coming weeks and will look to quickly bring in the players he feels can help Everton progress and close the gap on the current top 4. It is important to remember that the gap is not that wide, and although the manager has a very different footballing ethos to his predecessor, he will not be looking to make too radical a change too quickly. The majority of the Everton midfield are comfortable on the ball and will thrive in the more patient Spanish style preferred by Martinez. The back four will be encouraged to pass the ball out from the back and everyone inside Goodison will be relieved to see the end of the long diagonal balls from Jagielka and Distin that far too often failed to find the intended target. 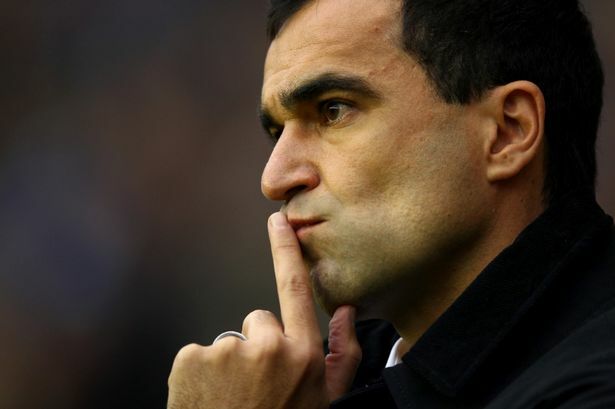 Martinez’ biggest challenge will be to find goals in this Everton squad. Jelavic will look to enjoy a fresh start and centre forward is likely to be an area of focus for the new manager and his modest transfer kitty. Many have been critical of Everton’s approach, but whether you are a Bill Kenwright supporter or not, he has trawled through the available options and settled on the current FA Cup winning manager. For all his obvious differences to David Moyes, Martinez possesses many qualities similar to the outgoing manager and these will have attracted Kenwright in making his final decision. Martinez has built a reputation as a studious manager, studying opponents, players and rival managers, to develop his approach to the game and ensuring his team are tactically prepared for each and every game. The Spaniard has an incredible drive and hunger for work and will dedicate 15/16 hours a day to ensure Everton progress as a football team. He also works incredibly closely with the Chairman and similar to Moyes and Kenwright, developed a tight bond with his former Chairman, Dave Whelan. This is particularly important at a football club where money is tight, and Martinez will very quickly learn that he has to squeeze the maximum out of every pound, to ensure Everton continue to operate in the top six of the Premier League. It is the start of a new dawn, the Peoples Club might be no more, but Everton begin a brave new era, with a new Spanish manager at the helm. Welcome to Goodison Roberto, we are right behind you.